tomatoes | i made it so. This entry was posted in green thumb, in the kitchen and tagged cherry tomatoes from the garden, garden 2013, lewis grizzard tomato quote quotation, ripe red tomatoes. Bookmark the permalink. We’ve been picking some of those too! Not as many as I would wish, most of them are still green. My 3 year old daughter helps me pick them… regardless if they are red or orange/yellow! If they are not green, she says they can be picked! And they are soooooooooo good! they are! it’s interesting, the ones on the side of my garden that get morning/noon sun are doing better than the ones that get afternoon/evening sun. that, or the soil in one plot is better than the other. also, i bought “early girls” this year and they live up to their name. but i think i want to try some heirloom tomatoes next year. we’ll see. enjoy those little hands in the garden, so sweet. Sun kissed yummy and fresh…doesn’t get much better than that! I’m gathering photos for my own summer garden update. I got bowlfuls of cherry tomatoes before the plants succumbed to a bad pest infestation so I’m grateful. Can’t wait to try again! 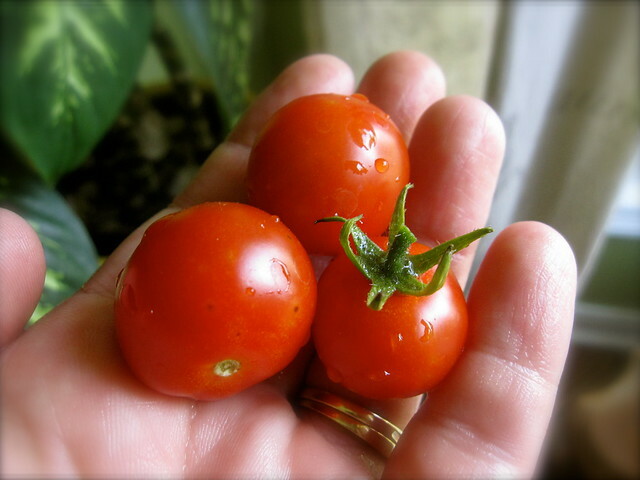 Homegrown tomatoes cannot be beat! i’m happy you’re happy! that’s lovely. the days are flying by here, and i really should update with a new post. soon it will be back to school and winter and these lovely greens and reds will be a distant memory (think of supermarket tomatoes in january — yum ;))… so enjoy these days while we’ve got them. i am.